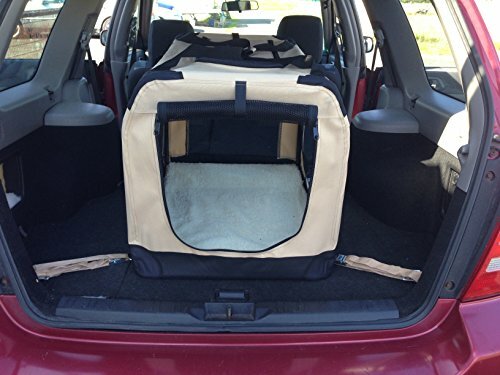 Extra Large Dog Crate Folding Fabric Oxford 600D BEIGE XL 81cm. 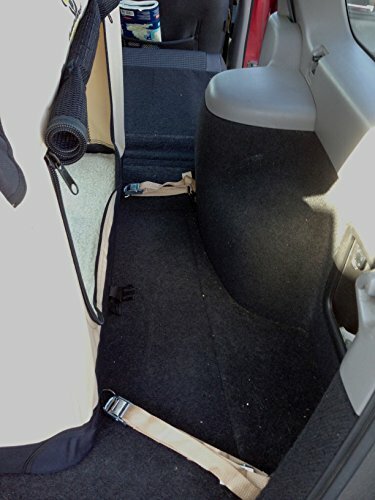 Vehicle Isofix anchor points for the ultimate in safety. Free Zipped Fleece Liner. Product prices and availability are accurate as of 2019-04-09 11:33:42 BST and are subject to change. Any price and availability information displayed on http://www.amazon.co.uk/ at the time of purchase will apply to the purchase of this product. 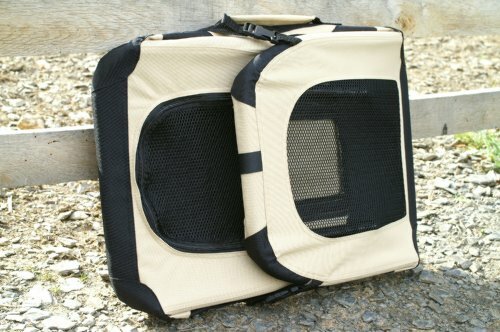 Our dog carriers all feature a lightweight, collapsible design, allowing the dog carriers to be quickly assembled in a few moments. 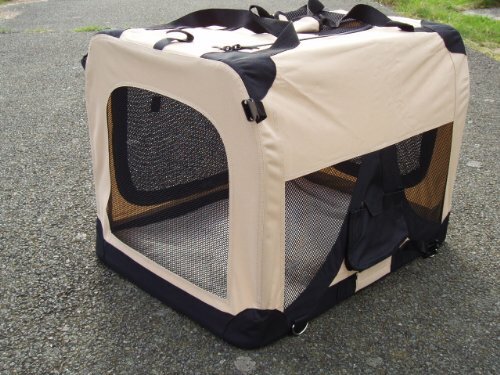 The dog crates are light and airy ensuring your pet never feels boxed in or gets overheated. 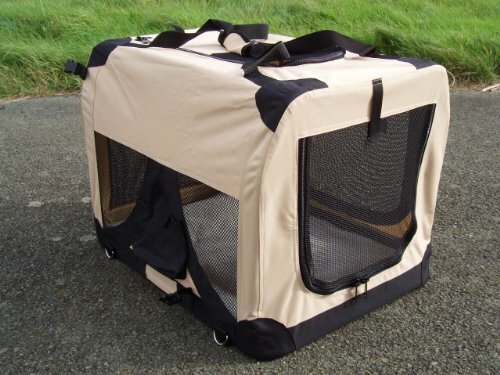 Ideal whenever you need to transport your pet safely and securely. Dog crate features: Strong mesh windows on all four sides. 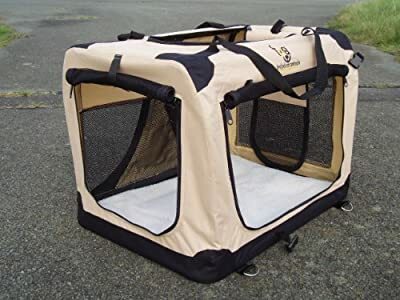 Zipped mesh openings to top and front and side of the dog crate, allowing you to comfort your pet without the risk of escape(can be secured open with velcro straps if required).All dog crates feature a washable/removable outer cover of heavy duty, water resistant 600D Oxford fabric. Carry handle. Carry straps Available in Blue or Beige Reinforced corners for durability Carry pouch for treats ect. Removable washable fleece liner. Four unique lower steel D rings to anchor within a vehicle and ground pegs to secure to soft ground. Size Guide: Please note that this is only a rough guide as all breed sizes can vary. Small- 19.5 in: Cats, small puppies, Chihuahua. Med- 24 in: Westie, Jack Russell, Cairn Terrier, Yorkshire Terrier, Large Cats Large- 27 in: Staffordshire Bull Terrier, Springer Spaniel, Beagle, English Bulldog. XL - 32 in: Boxer, Basset Hound, Whippet, Border Collie. XXL - 36 in: Greyhound, Alsatian, Labrador, Golden Retriever, Rottweiler, Dalmatian, Doberman.